ClickPrinting.ie appointment cards are useful for marketing businesses that utilize scheduling of clients and appointments. 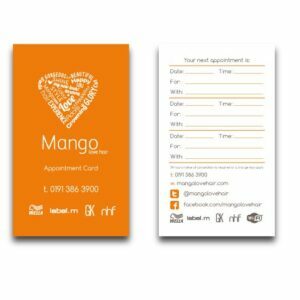 They are a great asset to any business or organisation whether you’re a doctor, dentist, optician, chiropractor, physiotherapist, vet, photographer, hairdresser, estate agents – we are sure that our printed appointment cards will have you covered. They are handy in reminding your clients of there next appointment and keeps your brand to the front of you customers mind, resulting in clients holding on to cards for longer, ‘just so they don’t forget, cause sometimes we can’. Order your’s today, appointment cards come with an optional matte lamination, note that only ball point pens can be used on these type of laminated cards.